Urban American Outdoors TV (UAOTV) and the Kansas City Kansas Community College will host the 10th Annual Urban Kids Fishing Derby. 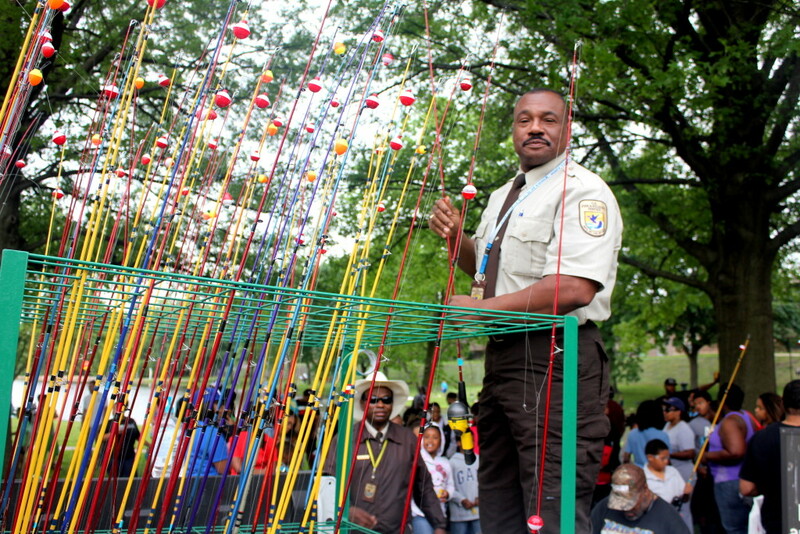 The Saturday fishing experience and celebration will be held on May 16, 2015 at the Kansas City Kansas Community College duck pond next to the Conference Center, located on the south end of the campus at 7250 State Avenue, Kansas City, Kansas 66112. Registration begins at 8:00 AM and the derby kicks off soon after ending at 12 noon. This being the 10th year means this will be a very special fishing experience. Along with the derby we have some new exciting community partners that have come on board in a big way. Partnering host includes KPRS Hot 103 Jamz, KPRT Gospel Radio, USFWS, Hiland Dairy Foods and the Kansas Speedway. Our new partners are going all out to ensure that the kids will have the star treatment and good time. Gates Bar-B-Q, a community favorite has always provided the hotdogs and their famous sauce for our kids. F.A.C.T.S another longstanding partner provides tutoring and mentoring services to our community children for over the past 30 years. Also in attendance will be Deputy Director of Operations, James Kurth , of the US Fish & Wildlife Service from Washington DC as our special guest speaker. The Kids Derby is free for youngsters between the ages of 4 and 16, and must be accompanied by a parent or an adult. All registered participants must bring their own rods, reels, and bait. If you do not have your own rod & reel we will have loaner poles at the derby. If you are interested in having your youngsters participate, email us for forms at uaotv27@yahoo.com or call to pre-register, there will also be forms at the event. You may also register on KPRS website. The derby is limited to the first 250 kids. The young anglers who have the winning catches will receive gifts and other outstanding prizes. For the biggest fish there will be a $103.00 prize. We will also have goodie bags and hot dogs. The entire derby will be filmed for an upcoming segment on Urban American Outdoors TV with national host Wayne Hubbard. Award winning Urban American Outdoors TV show airs weekly on Local Bounce TV every Saturday at 7:30 am and on other TV affiliates across the country. The show offers sports enthusiast’s a chance to view outdoors from a different perspective. Wayne Hubbard has for the past 16 years been sharing his outdoors adventures, conservation tips, green ideas, food & recipes and wildlife information. UAOTV has also mentored over 55,000 youth in the greater Kansas City area. So if you’re a parent, gather up the children and enjoy a day of family fun at the 10th Annual Urban Kid’s Fishing Derby, Saturday May 16, 2015. We will be having a day of celebration! You do not have to know how to fish, the event is free, and there will be plenty of family fun, fishing and volunteers to help. For additional information or should you have any questions please contact Candice Price, Executive Producer of Urban American Outdoors TV at uaotv27@yahoo.com,facebook or by telephone at 913-334-5177.